Endodontic treatment, or root canal therapy becomes necessary when the pulp, or inside of the tooth becomes inflamed or infected. This inflammation or infection can be caused by deep decay, repeated dental procedures on the tooth, or other damage to the tooth. If the pulp is not treated, it can cause pain, sensitivity, discoloration, swelling, and/or tenderness. Endodontic treatment is a procedure to save your tooth rather having it extracted due to pulpal disease. Patients typically receive local anesthesia to insure comfort during treatment. A temporary filling will be used to close the opening that was made in the tooth. Your tooth may be sore after treatment, which is usually controlled by over-the-counter medications. If your infection is severe enough, you may receive a prescription for antibiotics and/ or pain medications. 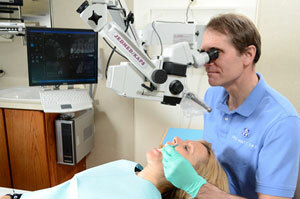 Normally your treatment will be completed in one or two visits. You will be able to drive and return to work after treatment. After your treatment is completed, you will need to return to your referring dentist to have the temporary filling replaced by a permanent restoration. Sometimes it is necessary to retreat a root canal because of infection after previous treatment. Some of these cases are caused by inadequate or incomplete prior root canal treatment or leaking fillings. 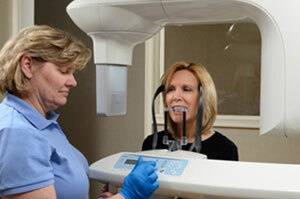 Your tooth will be examined to determine the best treatment option. During retreatment, your tooth will be re-opened and the previous root canal filling materials will be removed. Then the canals will be re-cleaned and shaped, and new filling materials will be placed into the canals to seal it. Occasionally a minor surgical procedure is required to remove infection from around one or more roots. This is performed in our office with a surgical microscope, and requires only local anesthesia ("Novacaine"). Before: If you are instructed by your physician to take an antibiotic prior to treatment, please be sure to take it as prescribed. It is not necessary or beneficial to stop any other medications you are taking. Please bring any information which your dentist has given to you. Also, remember to bring your downloaded patient form filled out and be sure to include a list of all medications you are taking. After: It is important that you return to your general dentist for a permanent restoration after your treatment with us is completed. The tooth being treated has been sealed, but the outer surface must be protected against fracture and decay. To help speed up the registration process at your first visit, please download our Patient Registration Form so you can complete it beforehand.